Minions could have been a better edited, better directed and a much better written film, says Paloma Sharma. Minions: Cute little capsule-shaped yellow things that speak gibberish and have an obsessive relationship with bananas. Even Grumpy Cat doesn't totally despise them. So if the Minions were to star in a film, what could possibly wrong? 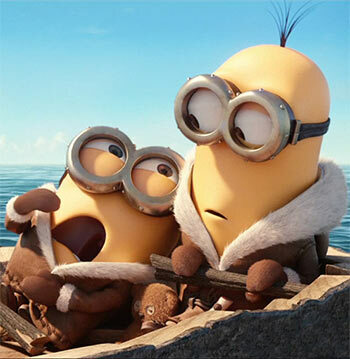 The prequel to Despicable Me, Minions follows the lives of Kevin, Stuart and Bob (and the rest of their tribe) as they seek the biggest villain to serve and bring back hope and purpose to their tribe. Minions evolved from single-celled yellow organisms to single eyed (although some have two) and minimal haired yellow humanoid beings. All throughout their existence, they have had only goal: to serve the most evil master they could find. From T Rex to the ruthless Egyptian Pharaohs to Napoleon, the minions have served many evil overloads but failed to keep any one. Disheartened and without direction, they retire to a life of monotony until one heroic minion, Kevin (Pierre Coffin), decides to restore their lost glory. Along with Stuart and Bob (both voiced by Pierre Coffin), Kevin travels to faraway lands, seeking a most diabolical boss. Until he finds Scarlet Overkill (Sandra Bullock), most villainous villainess in all the universe, and falls in love with her. Mrs Overkill, however, has no such feelings towards Kevin and his tribesmen. While the Minions may be dedicated, loyal henchmen, their new boss doesn't exactly have the best of intentions towards them. The Minions, as characters, were designed to play sidekick. Hence it comes as a surprise that Coffin and co-director Kyle Balda decided to use them as protagonists. Without a master villain taking centre stage, the tribe of Minions has as little direction as the story of the film. The plot is all over the place. Despite cool pop culture references and giggle-worthy jokes, Minions can't seem to decide where it wants to go and what story it wants to tell. The story only really begins in the second half of the film and by the time it's over, you wonder why the first half wasn't cut down to 10 minutes. Minions could have been a better edited, better directed and a much better written film. But it clearly wasn't an easy film to make. It is commendable how the language barrier has been worked around and dialogues are comprehensible, at least in part. Minions is full of hilarious sketches and awww-inducing moments. The final 10 minutes of the film are brilliant! Minions scores brownie points for effectively connecting the prequel to the rest of the franchise. But one can't help but wonder what the point of the film was. Without a strong character to lead, a film starring the sidekicks isn't all that interesting. Furthermore, Scarlet Overkill's backstory goes largely unexplored and hurriedly wrapped up.